This Iranian bowl is an accurate copy of a Chinese original in both its shape and its decoration. Here there are lotus sprays on the outside, and the border around the inside of the rim is a distinctive feature of Chinese porcelains made between 1522 and 1566. In the Safavid period (1501-1722) Iranian potters developed new types of fritwares inspired by Chinese blue-and-white porcelain. In fritware, the main ingredient was fine quartz powder made by grinding sand or pebbles. Small quantities of white clay and a glassy substance known as frit were added – the clay to give plasticity, the frit to bind the body after firing. Unlike high-fired Chinese porcelain, low-fired fritware was soft and porous, but like porcelain it was white all the way through and could be used to make convincing substitutes. Fritware bowl, with underglaze painted decoration. There are lotus sprays on the outside, a thin geometric border around the inner rim. The imitation of Chinese blue-and-white porcelain continued in the Middle East until the 18th century. These two bowls are close in date and have the same shape, with a high foot and rolled rim. Yet one was produced in China, and the other in Iran. 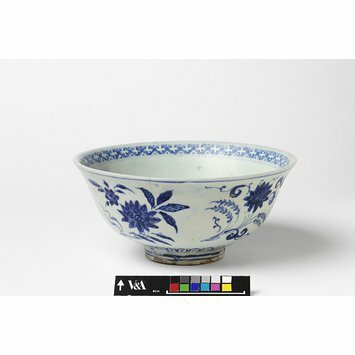 The Chinese bowl bears a reign mark for the years 1426-35. Its decoration suggests it was made much later, but imitating the earlier style. The Iranian bowl is an accurate copy of a Chinese original, in both its shape and the decoration of lotus sprays on the outside. The border around the inside of the rim is a distinctive feature of Chinese porcelains made between 1522 and 1566.